THE Currajong Disability Services Swimming Carnival is on again in what promises to be another exciting day on the activities calendar. Team Leader of Direct Care and Activities Indigo Kriedemann said that the carnival is always a popular event and often well-supported. “Every year the carnival proves to be one of the successes of the calendar year,” she said. “All of our clients enjoy a swim and getting into the spirit of the day. 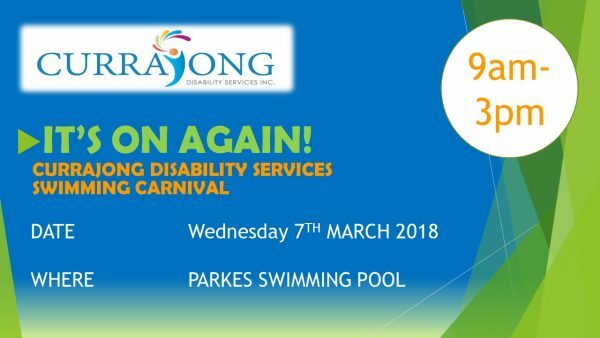 The annual Currajong Disability Services Swimming Carnival commences at 9am and will finish at 3pm. There will be a number of events on the day and if previous years are anything to go by it will be one of the CDS flagship events of the year. “Our clients love swimming and for many it is an important part of their routine,” said Indigo. “It is great to see them participate and gain more water confidence.